Ok, so for Augusts monthly mani the theme was Romance in Bloom. Did you know that August is National Romance Awareness Month? Me either! You learn something new every day! 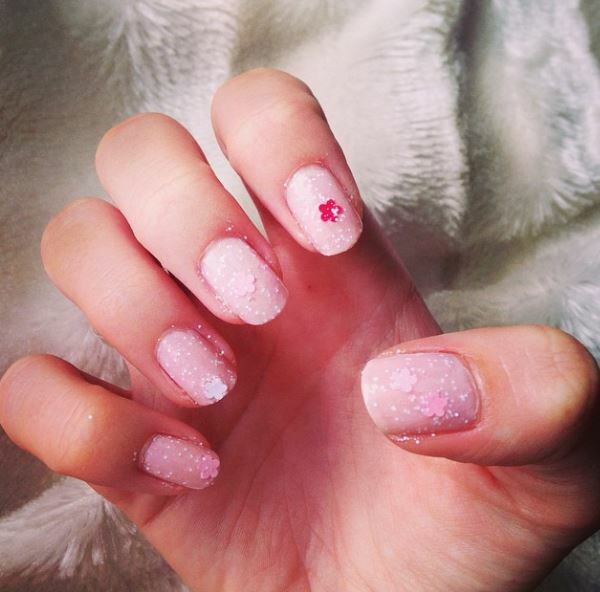 I did have a super cute mani all lined up for today which was a gorgeous pink nail colour with a white dainty little heart. Sadly my unsteady hands let me down again & the heart was more of a blob! Alas! There was NO way I could post it today & since I was pushed for time I had to cheat & instead post a mani that I did a few weeks ago. I hope you will all forgive me for my slight cheating but I promise this nail polish is so cute! I started with a beautiful Ballerina ink colour by Essie & then added my new favourite polish ever, Daisy Lane by Nails Inc. This is possibly the cutest nail polish I have ever purchased. 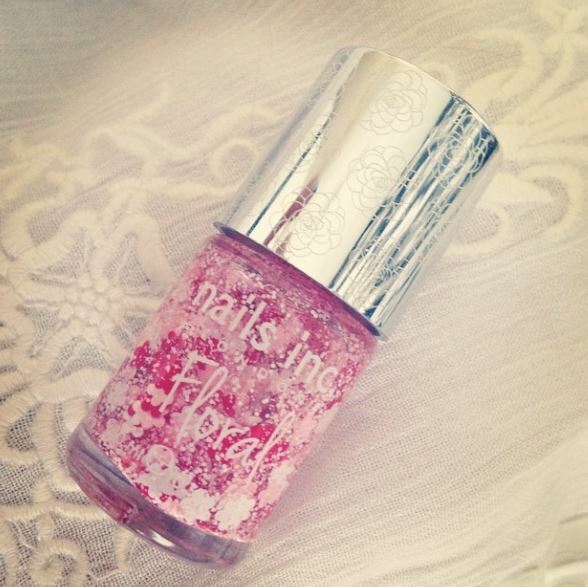 It has dainty flowers in the bottle which come in 3 different shades & cute white speckles. Anyway, please forgive me for cheating slightly, hopefully next month will work out better! That nail polish looks supper cool and I like how the nail art turned out! So cute, and I love that one hot pink flower pop. I’m with you, I had to redo my nails after my original flowers just looked like giant messy blobs! Super cute! Love the flower/speckle details in the polish! This is so simple but oh so cute! Great job!!! Can you live in my house and do my nails.. LOL plz? JK but seriously your nails look amazing. Wish I had that ability :P.
That polish is cute! I like that it gives your nails a polka dot look! That nail polish is amazing!! Heading out to look for it just now! Nice Manicure doll.